Torsion springs of this type are easy to make AND design. As ends of spring move there is no angular component changing the rate of the spring. 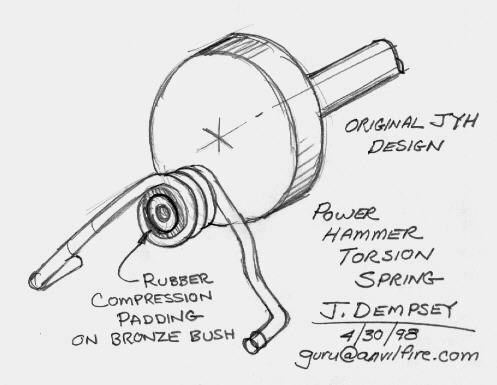 Since the spring diameter shrinks as the arms move inward the spring should be mounted on something resiliant. Rubber or leather. That in turn should have a center bearing bushing. A true scale layout will likely indicate a large steel bushing with a bronze bushing inside of that. This design still requires toggle link vector calculations. This spring can be made out of mild steel if you keep the stress under the yield point! Be a good way to prototype! End retainer not shown. If a center bolt is used (threaded hole shown) then the crank should rotate in a direction so the bolt will tighten in operation rather than loosen.